Is it time to face your challenges and thrive? Do you worry that you're too sensitive? I need to grow a thicker skin. Things affect me too much. I need to let it go. If you feel this way, there's good news--You’re not alone. You're not broken, either. When you learn to see yourself clearly, as you are, with all of your strengths and imperfections, your life changes. Therapy with us can help you to gain a clear, compassionate, whole sense of who you are. get overwhelmed with all the pressures of being a teen? it doesn't have to be so hard. Therapy can help! At Thrive, we love to give teens a safe place where they can work through their struggles, talk openly about their overwhelm while learning a multitude of healthy coping skills, improving their communication skills and building healthier, happier relationships. Have you been struggling with anxiety or depression or both for far too long and it's time to make some changes? have difficulty recognizing your own worth? there's hope. life doesn't have to be so painful. When you are able to self-soothe and focus on your own self-care, there's relief to be had. Then, as you dig in and explore and come to understand the origin and triggers of these feelings, you can make positive, life-altering changes. You CAN have a life that brings you joy and contentment. It IS possible. Therapy can help. We'd love to help. 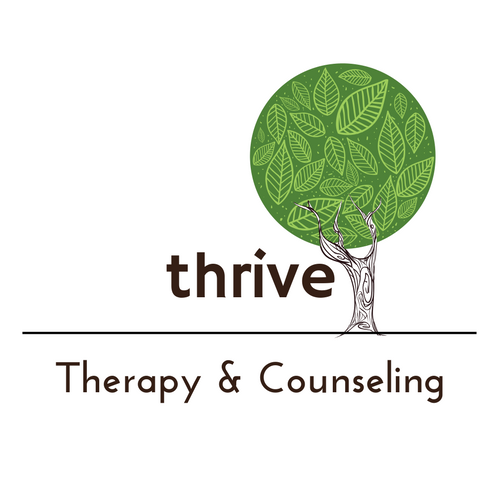 I can't say enough about our team of amazing therapists at Thrive Therapy & Counseling. I'm so proud of the work that we do and of how we support our clients and our community. Whether your concerns are about your child or teen or about your own challenges with anxiety, depression, trauma, parenting, your relationship or military service, we've got highly trained, fantastic therapists who specialize in your needs. All you need to do is reach out. We're a warm, happy, supportive, fun-loving group of therapists who are passionate about supporting our clients. At Thrive, we know the struggles of being human, and we know that with support and tools, we can face our difficulties and come out on the other side even stronger and more resilient.